looking for a high flow cat for 08 Lucerne cxs 4.6 any one got any info on this , or has done one !! Cats are the least of worries when attempting to up tune an exhaust. Even headers can be oversized and will completely hinder the push/pull theory behind the idea. Back pressure at one time was thought to be the best scenario by cushioning the valves on closure along with who knows what other ideas. Most exhausts will downsize anyways by the time they exit. The only difference between 2 1/2" and 2 3/4" is one pipe is fitted inside or over the other dia. 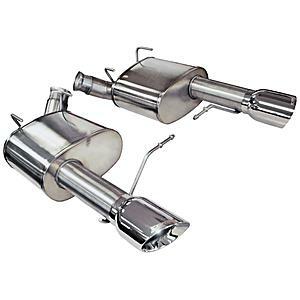 Mufflers are the real mystery, the way they downplay everything up to that point with reverse flow, multi or downsized baffles with no limits. I used to like the Royal Scott bullet glass packs.... Now those were straight through but way reduced internal diameter, talk about back pressure? Cats usually are same or large ID as tubing, the ones I'm familiar with. They actually make a perfect resonator/muffler with the honeycomb monolith. Thusly a more performance orientated muffler is the way to fly. Do not go loud with a 4 or 6 cylinder car, they sound like s - - t.
My Boss has stainless 4" tips on exhaust. What a joke that is, supposed to make you believe 4" exhaust throughout, nope! Last edited by Rich B.; 10-14-2017 at 06:08 AM.